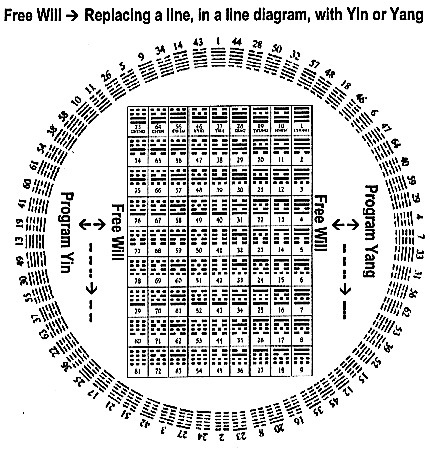 This posting will derive the Final Version of the Integrated I-Ching—Big Bang—Computer Logic, which forms the Holon of God’s Input in the formation of this Matter-Being Participatory Universe. 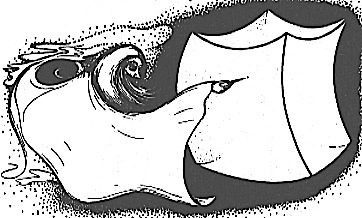 Notice, till now, minor conflicts exit in the logic discussions of the I-Ching (based on two octagons) violating the Holon principle of Matter—Being—Matter-Being, or Observer—Observed—Reference Frame. It is these conflicts that generat the Logic Symmetry Breaks, which initiated the Big Bang. Within this God’s Holon is the concept of Good and Evil. In short, Good implies a state moving toward God’s Logic, while Evil is a state moving away from God’s Logic. 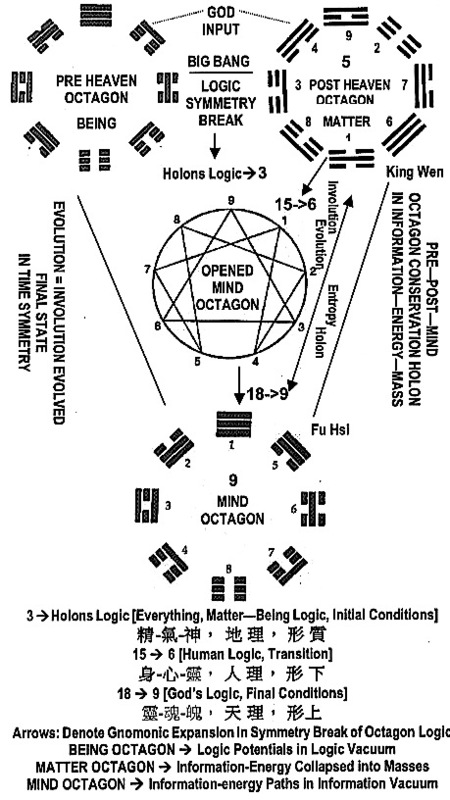 Continuing the Big Bang Logic Symmetry Break discussions presented in posting On Time and Time Travel, the following details within this logic break is diagrammed below from the Octagon Holon of the Integrated I-Ching—Big-Bang—Computer-Logic standpoint. The logic embedded within these logic symmetry breaks (interactions in information paths, and programming) is illustrated in the next three diagrams. 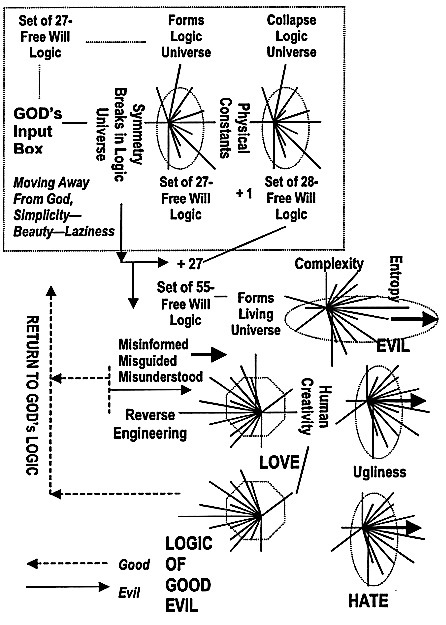 The next two diagrams are on the Holon of Free Will—Good—Evil. 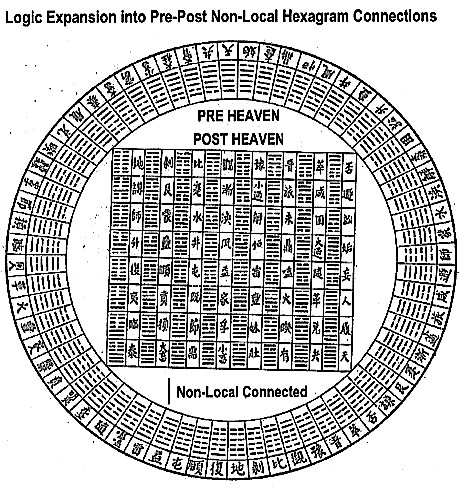 And the next diagram is on the three sets of Tetragrams defining Mind Logic—Post-Heaven Logic—Pre Heaven Logic. Finally, the criteria of Good and Evil as diagrammed below. Remember, these sets occurred only at Symmetry Break, with the purpose of setting up the initial-final conditions of the universe including us Humans (and are encoded in the Vacuum Computer). Notice, as indicated above, the 10—22—27 formula follows at Symmetry Break for both the Pre-Heaven Octagon and the Mind Octagon, which implies that the formula is encoded in the computer. (The Five Element Phase Transitions are not included in the above diagrams) The Post-Heaven Octagon is a slight modification of the Pre-Heaven Octagon for output purposes. This explains the fine tunings of the Physical Constants as described by Roger Penrose in the diagram below with his comments. On the other, the interactions between the Living Universe with its Free Will Logic Set at Symmetry Break (with 55 free will states) is much, much complicated. Yet, this complexity is guided by the One Free Will State in the Pre-Heaven Logic, namely the 6 obtained from the diagonals of the octagon (15 —>6, a human number). That is to say, the Physical Constants not only developed a precise Physical Universe, but also guided the development of a biological universe. QA: Why Universe is Accelerating? I shall conclude the discussion of Good and Evil, and let the readers study these diagrams for themselves. From these diagrams, the reader can interpret that through one’s spirit-mind and soul-mind can definitely be able to interact with both past and future Information-Energy Paths and/or the encoded logic potentials of these actions. Can we “see” and/or “know” the past and the future? The answer is Yes, with the following limitations and necessary requirements. Further discussions in relation to this posting and the posting on Time and Time Travel will be continued in the posting on Reincarnation.